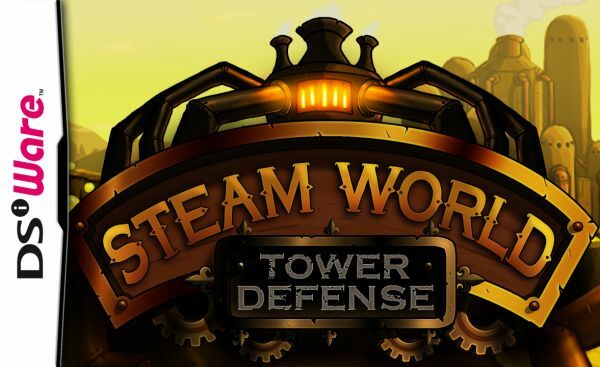 There’s no doubt that you'll know if SteamWorld: Tower Defense is for you upon asking yourself one simple question – do you like tower defence games? Not only is SteamWorld the essence of this sub-genre, it doesn’t try to pull anything crazy, either. If you’ve never played this type of game before, they’re quite easy to learn. You’re usually given a map that features one or more paths that your slow-moving enemies will take, and you spend your points (or money, in SteamWorld’s case) to set up friendly units that will hopefully destroy your enemies before they reach their destination. In this game, you're up against the most evil and sinister of beings ever to lay their feet on Earth’s soil – mankind! 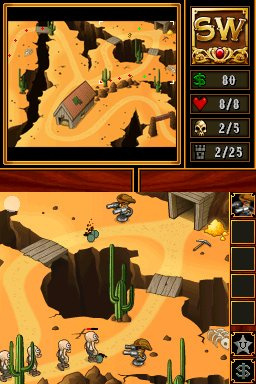 You play as the sheriff of the SteamWorld robots, and it’s your duty to stop the humans from infiltrating your goldmines by any means necessary. Maps are usually set up in a wild west-like setting, with cowboys and horseback riders trying to steal this most precious metal, and most feature unique gameplay-altering paths that make the player rethink their strategy. You'll be doing this quite a bit, too, as this is a very difficult game. Not that a challenge is inherently bad, but SteamWorld’s fun moments are usually accompanied by parts so frustratingly difficult you'll question your own existence. While the first levels are pretty easy, they too become very demanding at a breakneck pace. We were just beginning to figure out the fundamentals of our new units when we were bombarded by hundreds of enemies that quickly disposed of us. You’ll need to have a very effective strategy on every map if you want to make it through alive. 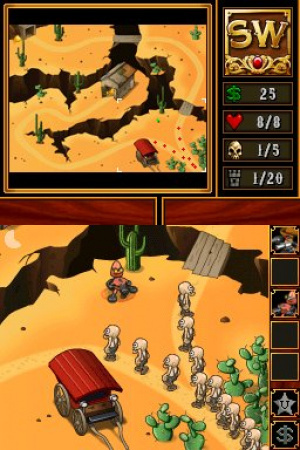 For example, some enemies are quite fast, so you’ll need to have placed plenty of costly sharpshooter units about, and you’ll also need to try and hit self-destructing enemies from far away so that they don’t hurt your units nearby. It's all very fast-paced, so you'll have to think on the fly and move those hands as quickly as you can to survive. Luckily, SteamWorld: Tower Defense is not an overly challenging game due to the developer's laziness; quite to the contrary, it plays and controls great. Using the stylus to choose your units and where to place them feels very easy and carefree, and moving the camera around the map can be accomplished by pressing and dragging the bottom screen, though we found that using the D-Pad, another option, was far easier. You can tap your units to see how much health they have, and you're able to control one by itself if you like. The visual style is a great mix of brown, yellow rusty colours mixed with smooth animations and a frame rate that stays solid even when things get a little crazy. The menus are nice and quick to navigate, though they could’ve been a little more visually appealing. The audio is also decent, though not very memorable, and the sound effects work when it counts but are nothing groundbreaking. There’s not much to do in SteamWorld beside the main quest. You can go back and play missions that you completed earlier to see if you can do so without losing any lives, but we didn't find that to be much fun, and there’s no score to keep track of, so the game doesn’t feature any leaderboard support. Considering that the price is only 500 Points, however, it’s far from the worst deal on the DSiWare store. SteamWorld is a well put-together tower defence game, though it can get very difficult after only minutes of play time. It doesn’t do anything especially interesting or groundbreaking, but if you’re looking for your next fix in the genre, then this might be for you. Pretty much what I expected. I'll pass on this, even if I do like Steampunk. And Tower Defense. I find Tower Defense to be very (as in VERY) boring, but hey, whatever floats your boat, I guess. The art style is really nice though. !!!! (I'm from the Czech Republic, sorry for the bad spelling) !!!! Since there are better Tower defense games on DSiWare ill pass. Nooooooooooooooo!!! I wanted this to be awesome! But.... It's not. @ labrat7: "I wanted this to be awesome! But.... It's not." You say that because of ONE review?! Just because IGN review say one thing dont mean its good the only review i believe is NintendoLife review and when they right they is always right! And ONE review is all i need from NintendoLife! There is not a lot of worthy Tower Defence on the DSi, Starship is pretty good and lengthy... but the others... they're not too good IMO. My main concern with Steam world is that it's short... I am now at the final mission.. and I got the game Tuesday, played 1 or 2 maps a day ('cuz some were hard and I had to restart a few times) and Friday I got to the final mission "Finality" (which I still haven't beaten yet). I really can't understand paying for a Tower Defense game, to be frank. I "do" love tower defense games but I still can't recommend this game. Quite frankly it's sloppy. The interface I find frustrating because you can easily place a tower instead of upgrading. The worst part is the difficulty. This is not just a "challenge". Some levels you will be convinced that the level is impossible. And that's on the "easy" setting. Also there is no real strategy to the game due to it's ridiculous speed and attempt at making the game active rather than proactive. It's more throwing plans and then see what sticks. And if you accidentally click the wrong spot...too bad game over. so is this game good and or bad because i have 2000 and only 165 bloks.tell me please. @AdamLikesYou Defence is the UK spelling. @plasti Please read the above review. for the fans of genre this game is must(this is my opinion based on what I have heard from my g/f who is a fan of comic tower defense games like ninjatown, plants and zombies and so on) Gameplay is pretty challenging (but if you try hard you will finally beat it), the art is funny, graphics are smooth even on XL, music is just nice so this game is descent and maybe the truth is somewhere between IGN and NL review. 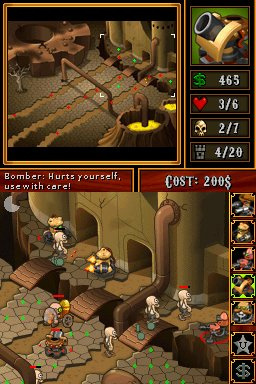 I like tower defense, and would like this to be good, but I just don't have the patience for something really hard. I'm not asking for a cakewalk, but I'm over games that are frustratingly hard. I'll pick a more well-rounded game. the only review i believe is NintendoLife review and when they right they is always right! Nope. They have unfair bias against certain games that while very enjoyable and fun to play, are severely marked down in score due to being a port. Anyone know if this game is available on the 3DS eShop? It was only a DSiWare game, but maybe it’s still being hosted on the eShop now? @Steviis_Father you can buy DSi games through the 3DS.